Stop diarrhea in dogs and cats caused by stress, antibiotics, or change in diet with Pro-Pectalin Tablets. Katolin clay soothes bowel and intestinal irritation and and absorbs toxins. Pectins, fruit-based fibers, help absorb water and firm stools. Pro-Pectalin's freeze-dried bacteria, Enterococcus Faecium, restores the population of helpful bacteria and reduces other harmful, diarrhea-causing bacteria. 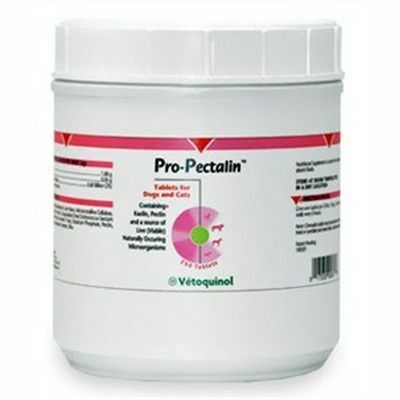 Pro-Pectalin Tablets will get your pet's intestinal flora back on track. Give one tablet per 20lbs. (9kg) of body weight orally every 8 hours. If diarhhea does not improve in 24-48 hours, re-evaluate diagnosis. Chewable tablet may be adminstered orally as a treat or crumbled and mixed with a small amount of food.